December 2000. As far as I was concerned this was the time to celebrate the millennium. When 2000 rolls over into 2001. Last Christmas and New Year I was unable to take any leave because I worked in IT and because the whole world was obsessed with the effect Y2K would have on all our computers. Working practically around the clock to ensure nothing disastrous would happen to the 1000 plus machines the department I worked in was responsible for was manic and being ‘on call’ for the 1st Jan was annoying in the least. I had dreamed of visiting my son in Sydney to see the 20th century disappear over the Harbour Bridge watching the firework display that the Aussies are famous for. It wasn’t to be. So now, at the beginning of December, a 26 day camping journey around South Africa, Namibia, Botswana and Zimbabwe awaited me as I stepped off the plane at the politically neutral named Cape Town International Airport. I couldn’t wait. After living in South Africa for 12 years in the ‘70s and ‘80s I was more than ready to explore the dramatic landscapes surrounding my beloved country. Friday: joined the rest of the group at a backpackers’ inn in Cape Town, all seem OK, but early days. Headed out for pizza, salads and shared a bottle of red wine with a couple of people. Slept badly – music until late, doors slamming, then showers running at one thirty followed at six by alarm clocks, barking dogs, more slammed doors and showers as another group departed. Saturday: strolled to Mouille Point after breakfast as the introduction meeting is not until 12:00 then off to Cape Point via the Ou Kaape Weg. I opted for the walk over to the Cape of Good Hope the western most tip of South Africa as I have been to the Point many times before. Glorious views, if a tad windy. On way back stopped at Boulders to see the African Penguin colony, now very windy and got sandblasted legs; penguins are cute but extremely smelly. Went to Europa in Sea Point for dinner with everyone and had a wonderful meal of Roquefort salad, Kingklip Malay and finished with South African coffee (amarula). Bed. By. Midnight. Sunday: left for Stellenbosch this morning, but we didn’t go into the town as I’d expected but to the Morganhoff wine cellar for a tasting. I wasn’t too impressed, sparse information on any of the wines and none of them took my fancy. Then went on to Spier where we bought a picnic lunch – you choose your own ingredients from the farm shop – and ate in the beautiful grounds, then it was off back to Cape Town and Table Mountain. After a lively discussion with Attila the Hun (one of the guides) about getting to the summit (she said we all had to climb up, but could get the cable car down), six of us headed for the cable car. Wonderful views from the top on a very clear and extremely hot day with not a drop of wind (if you know Cape Town then you know how unusual that is). Final stop was at the Waterfront where a few of us went shopping for last-minute items (hat, sunscreen, extra socks, Deet – you know the kind of thing) and a lovely pint of Castle lager. Sitting on a terrace listening to Christmas carols in 28° was rather bizarre though. After watching a decent sunset from the promenade went to dinner with another couple. Charles is beginning to give me a headache. Monday: departed Cape Town today –hurrah – I have been itching for this point to arrive. Now the journey can truly begin for me. Stopped off at Bloubergstrand for another sandblasting (windy), good views of Robben Island and that classic image of Table Mountain across Table Bay. A boring long drive up the N7 to Garies (change of itinerary already as we were supposed to go to the Cederberg mountains) with only a couple of stops for water and toilets. Discovered that the weekly anti-malaria tablets make me ill. Chicken stew for dinner was pretty good. Sleeping in a tent for first time in years was not. I couldn’t get comfortable and I had a cold, so couldn’t breathe! Tuesday: left at 7:30 for the drive north. The scenery changed to drier, semi-desert the further we went. Springbok was the last South African town before we crossed the border at Vioolsdrift into Namibia. It was hot. Arriving at Camp Provenance we made lunch before packing canoes to head out onto the Orange River (another alteration to the itinerary). Did I mention it was hot? I don’t canoe, and I’m not hugely fond of being on water though I love looking at it and that river looked fast in my opinion. We canoed for four hours against the wind and by the time we stopped to camp my neck and shoulders ached and my thumb joints were twice the size from gripping the paddles. One girl got sunstroke and the two Aussies had to be towed as they were exhausted. We slept outside in sleeping bags with a full moon beaming down like a search-light, the stars slipping sideways during the night and I discovered that Randy. Snores. Loudly. Wednesday: I forego the “optional” early walk up to a viewpoint on account of it being hot, even at 8:00 as I needed my strength for another day of canoeing down the river. Today was easier as there was no wind, but my Captain, a competitive canoeist herself, abandoned me half way for a swim and left me to paddle in circles before being rescued on the edge of a rapid. Fear and humiliation made my heart beat a bit more rapid too. But we made it to the end where we were picked up for the return to camp. Six hours of canoeing 40 km in 40° was not in my game plan, but still it was over now, though I can’t say I enjoyed it apart from seeing the earth move. The lunar landscape back to camp was interesting though. Butternut and gem squash for dinner. Slept outside under a tree as it was still very hot though maybe under a tree was not the best choice as I was woken in the night by something dropping onto my back. I sat up to shake it off and it scuttled away in the dark. I don’t want to think what it was. Search-light on again, wished someone would switch it off so I could sleep, and birds at dawn awoke me to another hot day. 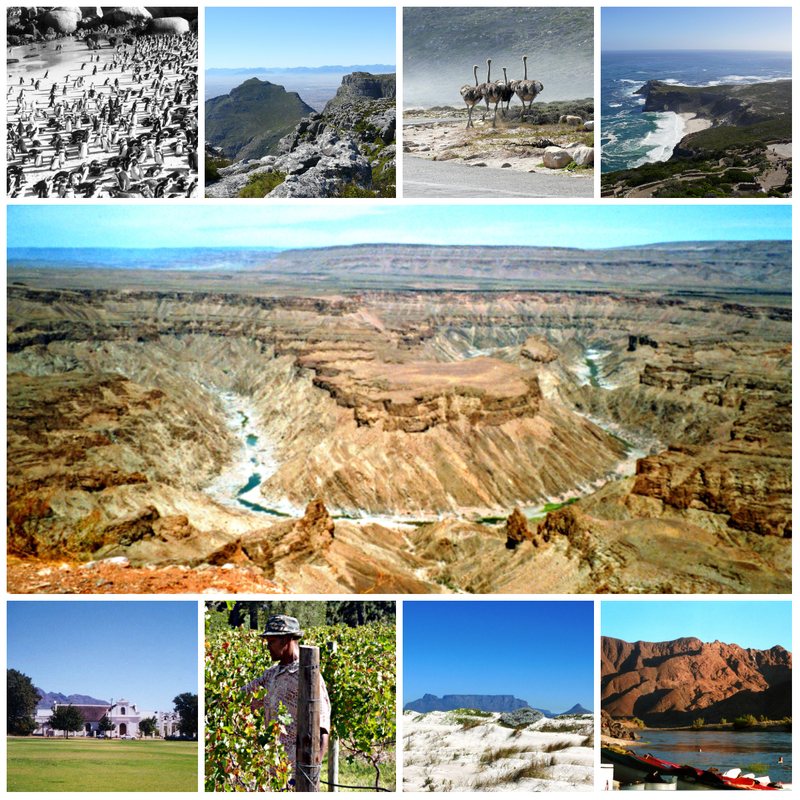 Thursday: after a couple of rusks and coffee we were off to the Fish River Canyon. The landscape changed from lunar to semi-desert, yellowish soil and small shrubs. Like Broken Hill in Australia with the wrong coloured soil. Arriving at Hobas camp it was 32° in the shade. We set up the tents then drove down to the view-point. Quite spectacular – the Fish River Canyon is a canyon within a canyon. The first occurred about 650 million years ago through erosion etc. Then 500 million years ago the second canyon was created by earth actions at the same time as Gonanda split up. The Fish River made its way through much more recently. The bushman’s version is that a huge snake making a getaway from predators made the canyon by snaking its way through the desert. I like the bushman’s version. Namibia was covered by an inland sea which accounts for the geology in the area. Another “optional” hike was offered to the canyon floor and back. Down was 270m over scree-covered slopes taking about 1½ hours and you had to carry at least 2½ litres of water. Up was another 2 hours. At first no-one opted for it, then not wanting to be chicken one by one members of the group agreed. Charles, Randy and Maia, the sunstroke victim, and I said we’d stay at the camp and get dinner ready. Maia and I headed straight for the swimming pool for a couple of hours, fortunately before a load of buses arrived depositing a large party of filthy overlanders covered in dust who took over the pool to play water volley-ball. By 7:30 and getting dark there was still no sign of the rest of the group and I was ready to strangle Charles. The party eventually returned at 8:45. Apparently Michael, who is in his mid fifties, struggled to get back up the canyon and everyone was exhausted. Maia and I cleaned up after dinner then it was time for a beer and bed. Sounds like a pretty exhausting trip. Despite the chance of seeing the amazing things you describe so well, I am rarely tempted by the rigours of camping, or sleeping outside. I am just a soft city boy I’m afraid to say Jude. Something to have done though, that’s for sure. It was definitely exhausting Pete – so many very early mornings, but then sleeping in a tent meant that it was much easier to get out of bed! It was the only way I could afford to spend 26 days in Africa and I was more than surprised at all the wildlife we saw, I chose the tour to see the countries, so the animals were such a bonus. Not sure I could do this now though – I’d want a bit more luxury. Our vehicle did have glass windows though – some only have plastic which lets in al the dust! It all sounds a bit of a nightmare, Jude. I’m exactly with you on water- I love being near it but on it can be a struggle. Hope things improve! 🙂 On a positive note, I love that last photo. Stay tuned Jo – it gets better, though I have to say it was a whole load of fun in spite of the challenges! It was a memorable trip – the scenery and the wildlife more than made up for the camping, but I did have a few days to relax after the trip! That is quite an experience. That canoe section would get me. I rowed down the Ganges in India for 4 days in 1986 (younger and fitter back then!) but we had a family of father and 2 sons to share the paddling with. When did you do your trip? I had to read them all again myself Pauline. Great memories of a wonderful trip. I am so glad I did it. I am shocked to see posts I wrote in 2013 as it seems I only wrote them last year! The canoe experience was not part of what I signed up for! Rather too adventurous for me. And others half my age!